25 November 2011 marks the 10th anniversary of NACO, the first adaptive optics system to be installed on the ESO Very Large Telescope (VLT). 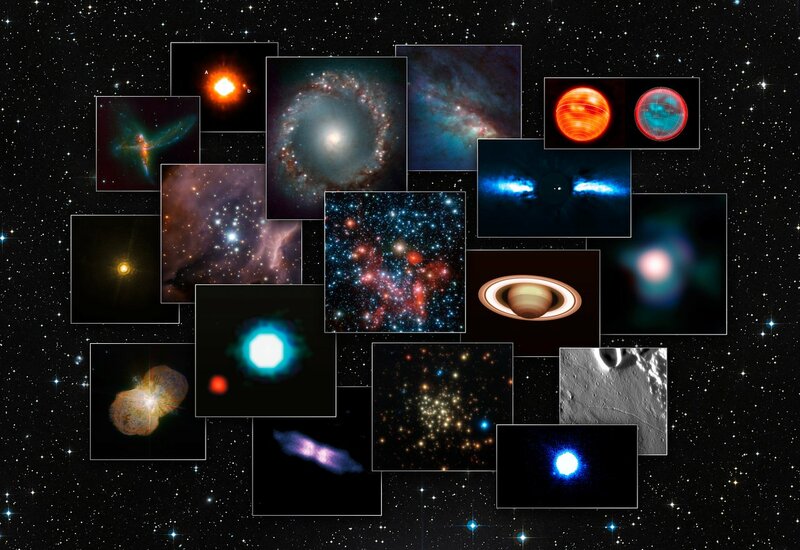 NACO’s ultra-sharp vision has greatly contributed to the major discoveries made with the VLT. NACO, short for NAOS-CONICA, was the first adaptive optics instrument to be installed on the VLT, in 2001 (eso0137). By compensating for turbulence in the Earth’s atmosphere, NACO greatly improved the telescope’s image sharpness and scientific potential. The instrument, developed by French and German consortia with the collaboration of ESO, was the first of a series of adaptive optics instruments that would be installed on the VLT Unit Telescopes. Some of NACO’s first targets were planets and moons in the Solar System. These observations provided the first detailed maps of Titan’s weather and surface (eso0505) and infrared images of Io’s powerful volcanoes (eso0204). NACO has also observed planets orbiting other stars. In 2004 it provided the first-ever direct image of an exoplanet (eso0428). By 2010 NACO had even been able to directly follow the motion of an exoplanet as it moved from one side of the star beta Pictoris to the other (eso1024). The instrument has also provided the first-ever spectrum of a directly observed exoplanet, allowing astronomers to study the planet’s atmosphere (eso1002). NACO has also been used to peer into the centre of our galaxy, its infrared vision being able to see through the dense clouds of dust along the line of sight. It was used to make a series of very precise observations of the orbits of stars around the black hole since 2002 (see eso0226 and eso0846). These crucial observations proved conclusively that there was a supermassive black hole at the centre of the Milky Way, This work has been rated as the first of ESO’s most significant scientific achievements to date (see ESO Top 10 science discoveries). Adaptive optics technology has continued to evolve, and a new generation of instruments is under construction or being planned to ensure that even better facilities will be available on the VLT in future. Looking into the next decade yet more advanced adaptive optics systems are under development for ESO's European Extremely Large Telescope, the E-ELT. The Nasmyth Adaptive Optics System (NAOS) was developed, with the support of the Institut National des Sciences de l’Univers/Centre National de la Recherche Scientifique (INSU-CNRS), by a French consortium in collaboration with ESO. The French consortium consisted of the Office National d'Etudes et de Recherches Aérospatiales (ONERA), the Institut de Planétologie et d'Astrophysique de Grenoble (IPAG, formerly Laboratoire d'Astrophysique de Grenoble) and the Observatoire de Paris: Laboratoire d’études spatiales et d’instrumentation en astrophysique (LESIA, formerly called DESPA) and DASGAL (which no longer exists). The project manager was Gèrard Rousset (ONERA). François Lacombe (Observatoire de Paris) was responsible for the instrument and the project scientist was Anne-Marie Lagrange (Institut de Planétologie et d'Astrophysique de Grenoble, OSUG, Université Joseph Fourier/CNRS). The CONICA Near-Infrared CAmera was developed by a German consortium, with extensive ESO collaboration. The consortium consists of the Max-Planck-Institut für Astronomie (MPIA, Heidelberg) and the Max-Planck-Institut für Extraterrestrische Physik (MPE, Garching). The lead scientist is Rainer Lenzen (MPIA), with Reiner Hofmann (MPE) as co-investigator. MPE press release: "Sharp eyes at the VLT - a decade of observations with NACO"
MPIA press release: "Adaptive optics at Europe's flagship telescope looks back on a decade of successful observations"
OSUG press release: "Dix ans d’optique adaptative sur le Very Large Telescope"
Observatoire de Paris press release: "Dix ans d’optique adaptative sur le Very Large Telescope"